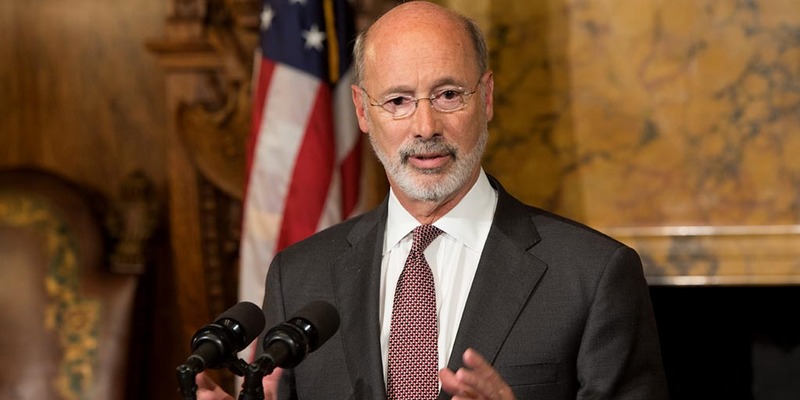 Harrisburg, PA – Pennsylvania Governor Tom Wolf today said Congress is complicit in the rate increases stemming from the President’s decision not to continue making cost-sharing reduction payments that help insurance companies offer affordable rates for health insurance. These changes will have negative impacts on middle class families, seniors, and the approximately 5.4 million Pennsylvanians with pre-existing conditions. In a letter to Pennsylvania’s congressional delegation, Governor Wolf outlined the impact of Washington’s sabotage and inaction, and his frustration that so many warnings had gone ignored. Since Governor Wolf expanded Medicaid, more than 700,000 Pennsylvanians now have access to health care – seniors, families, entrepreneurs, and people seeking treatment for substance use disorder. In that time, Pennsylvania has also cut our uninsured rate effectively in half. Over the past nine months, on nearly 50 separate occasions, Governor Wolf has highlighted the importance of the Affordable Care Act for Pennsylvanians in an effort to prevent this exact situation from happening. The Wolf administration urged Congress in August to take action to appropriate funds for the cost-sharing reduction payments, wrote to former Health and Human Services Secretary Tom Price to make the right choice for consumers, had former Insurance Commissioner Teresa Miller (now Acting Secretary of Human Services) testify three times before congressional panels, and has repeatedly stressed the potential impact terminating these payments would have on Pennsylvania consumers. The Pennsylvania Insurance Department has worked closely with insurers throughout the year in anticipation of Washington’s failure to ensure the cost-sharing reduction payments. As the Trump Administration and its Congressional representatives have failed to date in their shared duty to protect Pennsylvania consumers, Governor Wolf has worked in a bi-partisan fashion to promote commonsense reforms and he will continue to do everything in his power to shield Pennsylvanians from the impact of their inaction. If Congress had appropriated these funds, Pennsylvania’s rates would have increased by just 7.6 percent. Because of President Trump’s decision and Congress’ deliberate inaction, the increase will be significantly higher. Last week, President Trump announced that, effective immediately, he will no longer allow the Department of Health and Human Services to make cost-sharing reduction payments to insurers. This decision, along with others along the way, will increase costs for families and seniors, and hurt the approximately 5.4 million Pennsylvanians with pre-existing conditions. While last week’s acts were by the President, Congressional leaders are complicit in rate increases across the country, as Washington has utterly failed to make commonsense changes to fix our health care system and bolster the Affordable Care Act. They have pursued political goals instead of practical ones to actually help families and seniors. They have scuttled bipartisan efforts to stabilize our health care system and insurance markets. They have ignored countless governors, insurance leaders, and experts who have warned about the consequences of both their efforts and inaction. The Affordable Care Act is not perfect – no one believes that. But it has made Pennsylvania better. Since I expanded Medicaid, more than 700,000 of your constituents now have access to health care – seniors, families, entrepreneurs, and people seeking treatment for substance use disorder. In that time, we’ve cut our uninsured rate effectively in half. This means less people are forgoing care, getting sicker and then seeking uncompensated care in the emergency room. Over the past nine months, I have called to your attention on nearly 50 separate occasions the importance of the Affordable Care Act for Pennsylvanians in an effort to prevent this exact situation from happening. My administration urged you in August to take legislative action to appropriate funds for these payments, wrote to former Health and Human Services Secretary Tom Price to make the right choice for consumers, had former Insurance Commissioner Teresa Miller now Acting Secretary of Human Services testify, not once, not twice, but three times before congressional panels, and I have repeatedly stressed the potential impact terminating these payments would have on Pennsylvania consumers – your constituents. Let me be clear – we are in this situation because Congress chose not to appropriate these funds to begin with. The Obama Administration had to take action on these payments to fulfill a contractual agreement with insurers around the country. Failing to do so would have jeopardized access to affordable, robust coverage – exactly the situation we find ourselves in now. The elimination of $9 billion in cost-sharing reduction payments will only increase the number of consumers underinsured and uninsured in Pennsylvania. The Pennsylvania Insurance Department has worked closely with our insurers throughout the year in anticipation of this becoming reality. If the Trump Administration and its Congressional representatives are going to fail in their duty to protect Pennsylvania consumers, then we will do everything in our power to shield Pennsylvanians from the impact of this decision. We are prepared, but know this – if Congress had appropriated these funds, our rates would have increased by 7.6 percent. Because of President Trump’s decision and Congress’ deliberate inaction, the increase will be significantly higher. Again, this should not come as a surprise. We warned you and your colleagues of what would happen if cost-sharing reduction payments were not made. This is something you could have prevented, but now it is the reality Pennsylvania consumers must face. But there is still the potential to make this right. Congress must fund cost-sharing reductions payments for the final quarter of 2017, all of 2018, and beyond. Instead of playing politics by trying to say the Affordable Care Act is failing, do the right thing for Pennsylvania consumers and appropriate these funds. If you do not, your constituents will know who failed to protect them.